The Independent Order of Odd Fellows is celebrating its 200th anniversary this month and the DeMoulin Museum in Greenville is hosting a special program to observe the occasion. Founded in Baltimore, Maryland in 1819, the Odd Fellows now has 600,000 members worldwide. Known for their three link of chain logo, which represents friendship, love, and truth, the Odd Fellows were one of the fraternal customers of DeMoulin Bros. & Co. during the factory’s early years. 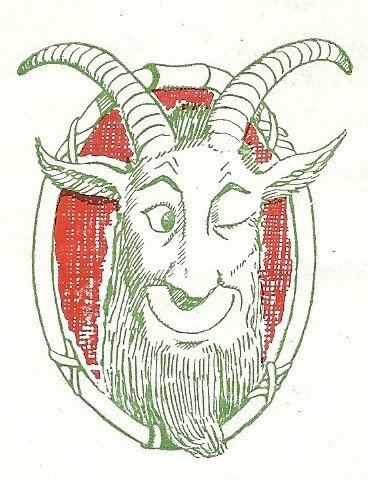 A special program, “Odd Fellows: 200 Years of Riding the Goat”, will be presented by Ainslie Heilich on Sunday, April 28 at 2 p.m. at the DeMoulin Museum. Heilich will explain who the Odd Fellows are, what they do, and how they factor into DeMoulin history. Odd Fellows artifacts, made by DeMoulin Bros. & Co., will be showcased. Free refreshments will be served following the program. Heilich is an Odd Fellow and founding member and Past Grand of Tuscola #316. He is also a member of Owl Creek Rebekah #91, Champaign Encampment #68, and Zonar Canton #18, all of Fisher, IL. He is also on the Grand Lodge of IL IOOF Web Committee and the Sovereign Grand Lodge Communications Committee and built/maintains their websites and Facebook pages and is a founder of the Heart in Hand blog. Ainslie is a tattoo artist and co-owns Vintage Karma in Tuscola, IL. When he is not tattooing or Odd Fellowing, he oversees the official website and Facebook page for guitarist G.E. Smith. The DeMoulin Museum, located at 205 S. Prairie Street in Greenville, tells the story of the founders, employees, and unique products created by DeMoulin Bros. & Co. For more information, call (618) 664-4115 or visit them online at www.demoulinmuseum.org or on Facebook.